Jared has 15+ years of experience in executive compensation consulting. Prior to joining Meridian, Jared was with Mercer for eight years as a Consultant and Principal within the executive compensation practice. He has experience consulting in a broad range of executive compensation matters that include executive and director compensation benchmarking, compensation strategies and pay philosophies, long-term incentive plan design, short-term incentive plan design, executive supplemental benefits, severance benefits, and change-in-control benefits. Jared has a proven capacity to help solve executive compensation issues and manage complex projects. 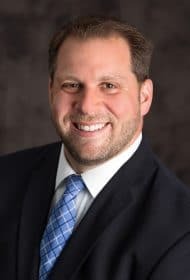 Jared currently works with publicly traded and privately held companies across a wide range of industries including: advertising, automotive, banks and financial services, hotels and resorts, manufacturing, payment processing, REITs, restaurants, retail, and steel. In 2018, Jared was a featured speaker at both the Equilar Summit and Corporate Board Member conference. He is a frequent speaker at NASPP and WorldatWork regional chapter meetings. He is a member of the Beta Gamma Sigma Honor Society as well as the Society of Human Resource Management (SHRM) and WorldatWork. He is also a Certified Executive Compensation Professional as designated by WorldatWork.